● Nearly two months after demonetisation and ahead of crucial elections in five states including Uttar Pradesh, Prime Minister Narendra today announced a series of sops for the rural and urban poor, farmers and traders hit by his demonetisation move. 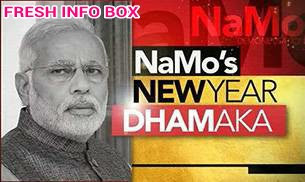 ● In a New Year eve address that sounded more like a budget speech, Modi announced interest subvention on housing for the urban and rural poor, provided enhanced credit guarantees to small traders and MSMEs, gave a 60-day interest waiver on select farm loans, and ensured higher interest earnings for senior citizens. ● Modi, in his 45-minute speech -- first in Hindi and then English -- directed cash-rich banks to go out of the way to help the not-so-privileged. He also announced that the government would give rebates of four and three per cent for home loans of up to Rs 9 lakh and Rs 12 lakh, respectively, under the Pradhan Mantri Awas Yojana in 2017. ● Terming demonetisation as a "historic cleansing ritual", Modi said people of the country had taken the biggest "shudhi yagna" after Diwali, and had, through their stoicism in the face of adversity, proved that a majority of Indians wanted freedom from corruption. 1. Two new housing schemes for urban poor. 2. Under PM Awas Yojana, interest relief of 4 per cent for home loan up to 9 lakhs, 3 per cent for up to 12 lakhs will be given. 3. Under PM Awas Yojana, to give poor and middle class homes, two new schemes have been introduced. 4. In 3 months, 3 crore Kisan Credit Cards will be transformed to RuPay credit cards for farmers. 5. 3 per cent interest waiver on loan up to Rs 2 lakh for construction of houses in rural India under PM Awas Yojana. 6. Government to bear 60 days interest on farm loans taken from District Cooperative Central Bank and primary society. 7. Credit guarantee for small traders to be raised to Rs 2 crore. 8. Kisan Credit Cards to be changed to Rupay cards for ease of use. 9. Rs 6000 assistance will be provided to pregnant women; the assistance money will be transferred to their account.